A rose Argent barbed Vert seeded Or upon a scroll Azure lined Argent edged and inscribed ROYAL CANADIAN HUSSARS in letters Or all below two swords in saltire points upwards Argent hilted Or surmounted by an eagle displayed Sable armed and langued Gules dimidiated with a sinister arm embowed vested Argent the hand proper holding a dagger palewise Argent hilted Or. The eagle, sleeved arm with the dagger and the crossed cavalry swords came from the badge of the 6th Duke of Connaught’s Royal Canadian Hussars where, originally, the eagle and arm came from the arms of the Irish province of Connaught and the swords represented the cavalry role of the unit. 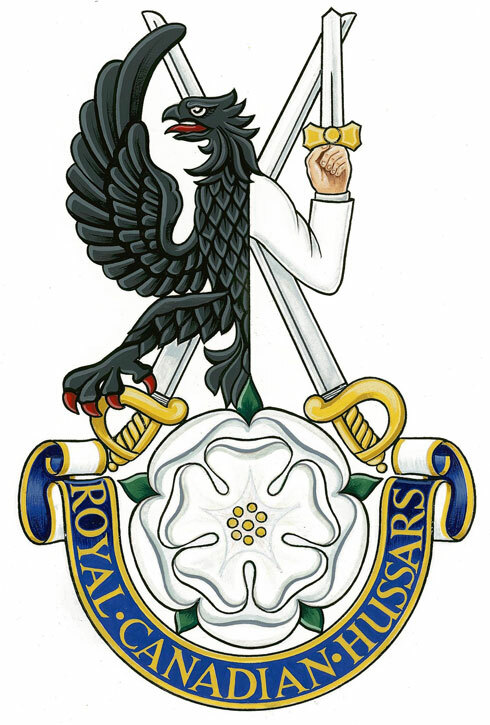 The white rose came from the badge of the 17th Duke of York’s Royal Canadian Hussars. It was originally the badge of the Royal House of York. “ROYAL CANADIAN HUSSARS” is a form of the regimental title. Meaning “Not for ourselves but for our country”.